The Habibi Hawaii Ensemble is a performance troupe of dancers and drummers representing authentic movements and rhythms of the Middle East. The members are all of different ages, backgrounds and nationalities. The Ensemble is Directed by Shadiya who is an award winning performer, international instructor and professional entertainer in Honolulu. She is also the President of the Middle Eastern Dance Artists of Hawaii. 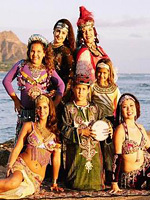 The Habibi Hawaii Ensemble specializes in traditional dances from Egypt and North Africa, and seeks to preserve culture and honor diversity through the celebration music and dance.